The red tackle revolution has lost steam. But it left lingering effects and pockets of supporters. Seems red hooks, lines, and lures have a niche. "It's no longer possible to call red a hot trend," says Alan McGuckin of Dynamic Sponsorships. "But the red-tackle craze created a cadre of anglers who continue to believe in the benefits of red line, lures, and hooks. Bass pro Greg Hackney is a huge believer in Red Cajun Braid. Says he hits it with a red marker when it starts to fade." Cajun Red fishing lines were created under the theory that red attracts fish. The selling point now is that red is the first color of the spectrum to disappear under water. The science behind either contention is sometimes contradictory. One study suggests that the rods and cones in the eyes of fish pick up red deeper than blue in brown, cloudy water. The theory that red disappears first may depend on water clarity. Wherever it gets too deep for light at the red end of the spectrum to penetrate water, only the red goes away — not the line, hook, or object sporting that color. So red doesn't "disappear" so much as change. It turns gray. A clear but tinted line seems to make more sense for stealthy applications than a solid, opaque, red line. "You won't see me fishing with an opaque red line," says TJ Stallings, marketing director and self-proclaimed "crazy ideas" guy for TTI-Blakemore Fishing Group. "When I got to TTI, Tru-Turn already had red hooks. So we started thinking red for Daichi. The first year out we sold more red hooks than any other color to crappie guys, who seem to be the most resistant to change of all angling groups." Marketing logic wasn't the only prod. Observation of fish behavior had a lot to do with it. "Ever heard of a pilchard ring?" Stallings asked. "It's a series of linked, stainless-steel rings hanging around a red ribbon. Pilchard get caught in the rings trying to reach the ribbon. The first laminated plastic worm was produced by Culprit in about 1977. The second laminate they released was red/black. My dad owned a bait shop in Orlando back then, and that red Culprit worm was the only color minnows would attack when thrown into the tank. We could throw any color jig into that tank, but the only one they'd gather around and pester was painted red. And when we pointed a laser light into an aquarium, fish followed the red dot. Whenever I've encountered walleyes in a tank, they seem to hit red hooks first, every time. Trolling for kingfish, if we put one red treble on one lure in a spread, it's the first one hit every time. The lures had three trebles each." With experiences like that spicing the sauce, Stallings helped convince Daichi to release the red Circle Wide Hook back in about 2000 and the Bleeding Hook craze began. Soon, similar experiences with red hooks were being reported all over the map. But people that have been around this industry have varying opinions about how and where it all started, and whether or not red is really a universal pattern solvent. A lot of product can be sold on hype, but if it's all smoke and no fire, sales eventually dwindle. The red craze may be leveling off in places, but it continues to skyrocket in others. Red hooks and "bleeding" lures seem to hold the best advantage. In shallow water, red implies blood which implies the lure is a wounded creature less capable of escape. But why won't red hooks perform precisely the same as other hooks down deep? Two winters ago, I sat beside guide Chris Beeksma fishing for smallmouth bass in 21 feet of water. He was landing one after another. I wasn't very busy. We used the same size and color Northland Buck-Shot Rattle Spoon. His had a bronze treble, mine a red one. When I finally switched to a bronze treble, my catch rate began to approach Beeksma's. That's not science, but I put it in my kit bag. I've had many similar experiences with red hooks. All of them good. For the fish. At the very least, personal experiences have proven to me that red hooks are no panacea. Doesn't matter how deep you're fishing, red hooks not only fail to disappear, they seem to morph into a color or appearance that rarely seems to help me catch fish. Red hooks continue to sell like crazy to steelhead and salmon fishermen in the Northwest. But, from what I've seen, red hooks seldom work better than bronze for steelhead in Midwestern streams, probably because steelhead are seldom deeper than 5 feet where red shows up better. I've spent a lifetime trying to hide hooks from steelhead, so I'm obviously prejudicial. I began asking around. George Large, Executive Vice President of Yo-Zuri America, remembers the appearance of the red Mann's Jelly Worm as significant back in the 1970s. "I would say the craze started in the late 1980s or early 1990s," Large says. "Remember the Texas Red Craw? Red lures began taking off about then. 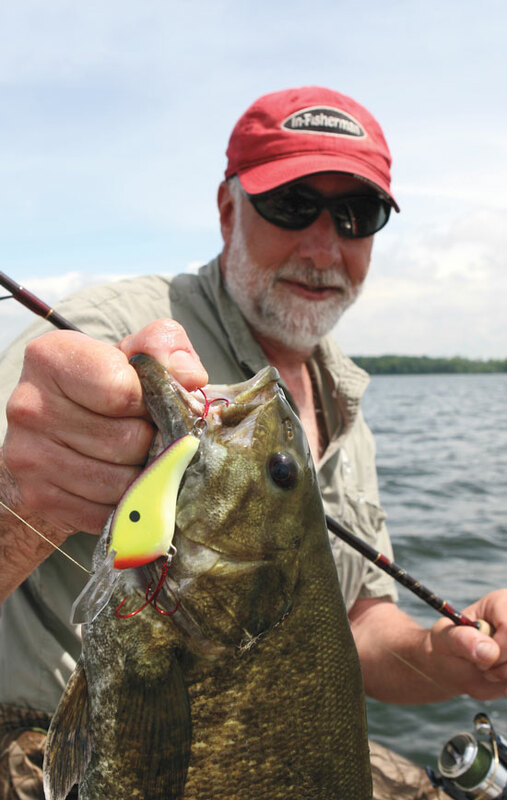 As far as red lures not being as popular or effective up north, I would say some of my favorite smallmouth, pike, and muskie lures have been fluorescent orange or fluorescent red, though that pattern has always been a weak seller. "As far as red hooks go, I remember TTI/Daichi spending more time and money on it than anyone else with their 'Bleeding Red' ad programs. When I was with Eagle Claw in the mid 1990s, it was just getting started and it's been gaining momentum ever since." Or not. "It certainly appears that the red fad in fishing, or at least in hooks, has begun to fade," says Matt Gray, product manager for Wright & McGill. "For example, our L091 round bend worm hook has seen sales dwindle by almost 50 percent in red from 2006 to 2009, while the same hook in Platinum Black has skyrocketed with sales increasing 96 percent over the same period. We've discontinued red hooks in many categories including bass, circle hooks, and livebait. There are always exceptions, and certain hooks such as our red L141 Kahle and L181 baitholders have had moderate growth over this period. Red is still a strong seller, but the frenzy and exponential growth have subsided." Lawrence Taylor, Public Relations Director for PRADCO fishing, described it as a shotgun effect. "We've cut back on production of red on some lures but not others," he reports. "My favorite pattern in our XCalibur Xr2 lipless crank is Toledo Gold (red back, gold belly)," he reports. "We designed it for Toledo Bend and Sam Rayburn as a regional pattern for rippin' the flats. But it became so popular we've folded Toledo Gold into our regular line and it's selling big nationwide." Toledo Gold is really three colors with natural countershading under a crawdad pattern, leaving us to wonder. Is it the counter shading? The craw appearance? The gold? The rattle? The wobble? The red? Or all the above? "Is there any scientific data pertaining to catching more fish with red hooks?" Large asked rhetorically. "I would say no. Of course you remember the old memory jogger from school, ROY G BIV — red, orange, yellow, green, blue, indigo, violet. Red, supposedly, is the first color to disappear, to be filtered out in the water column. But when you put the marketing pitch to fisher people then it gets related to blood and bleeding or injured fish." So which is it? If red disappears, so does the blood. The idea that red disappears first is only partially true. Back in the late 1930s, the Woods Hole Oceanographic Institute used photocells and submarines to measure the penetration of red and blue light in a variety of sites around the Atlantic Ocean and published a report on it. Red light penetrated to depths of more than 100 feet in some locations, and always to depths exceeding 30 feet. But in that investigation, differences in depth of penetration between blue and red light didn't remain constant. The report concludes, "as water becomes more turbid, differences in penetration of blue and red light become less." According to more recent studies in freshwater, red can actually penetrate deeper than blue in highly turbid conditions. Light, as we understand it today, is both wave and particle (photon). Each color of light in the spectrum has its own specific wavelength. Red has a shorter wavelength, meaning it takes a wider path than blue, and that's why water tends to absorb it faster. But particles suspended in water scatter light. Apparently, red light hits more particles as it passes through turbid water and the scattering of red light is greater than that of blue. In very clear water, bass and walleyes rarely swim deeper than red light can penetrate. The more turbid the water becomes, the shallower fish live. All of which means the science behind the red revolution in fishing tackle is tentative at best. The reactions fish have to red, such as to pilchard rings, seem to be psychological factors. Do fish relate red to blood? That question takes us out of the realm of science and into psychology, which deals with thought patterns and behavior and can't be predicted with empirical certainty. Psychology isn't science and rarely deals in absolutes. So we're left with the idea that red suggests blood, encouraging attack. Even so, a red battle plan has limitations. Lures colored completely red are slowly disappearing from the shelves. Natural patterns — countershading in hues found in real baitfish — have dominated the patterns that have been selling for a long time. From a marketing perspective, and probably from an angling perspective, red as a highlight color seems to make the most sense. "I'd prefer fish to hit the hook rather than the bait," Stallings adds. "I want them to focus on one hook, the lead hook, so I replace front trebles with red ones. Practicing for a tournament, I'd put the red one on the back. Fishing for money, I want it out front." 'Nuff said. Matt Straw, Brainerd, Minnesota, is a Field Editor and frequent contributor to In-Fisherman publications.